After announcing last week that it would be implementing its SMART Monitoring-based HeartCheck™ ECG screening solution in select Rexall Pharmacies as part of the Canadian Stroke Prevention Intervention Network's ("C-SPIN") trial for atrial fibrillation screening and stroke prevention, CardioComm Solutions (EKG-TSX.V) today announced that it has become an approved vendor for the sale of HeartCheck™ products and ECG-based software solutions into numerous organizations within the umbrella of the U.S. Federal Government. As an active registrar in the U.S. Federal Government's System for Award Management (SAM), CardioComm Solutions is now eligible for contracts, assistance awards and to do business with the U.S. Federal Government and its agencies globally. CardioComm Solutions, Inc. (EKG-TSX.V) has announced that it would be implementing its SMART Monitoring-based HeartCheck™ ECG screening solution in select Rexall Pharmacies during October 2014. Rexall is a Canadian pharmacy chain that operates more than 450 locations across 180 communities in Canada. This news is part of the Canadian Stroke Prevention Intervention Network's ("C-SPIN") trial for atrial fibrillation screening and stroke prevention, for which in-pharmacy screening is taking place at 20 select Rexall locations across Ontario and Alberta. The trial uses CardioComm's technology to aid in its atrial fibrillation screening process. This morning, CardioComm Solutions, Inc. (EKG-TSX.V), a developer of software for informational management solutions used within the diagnostic cardiac and telemedicine markets, announced the receipt of an FDA Class II Medical Device Clearance for its proprietary GUAVA II ECG Viewer software. 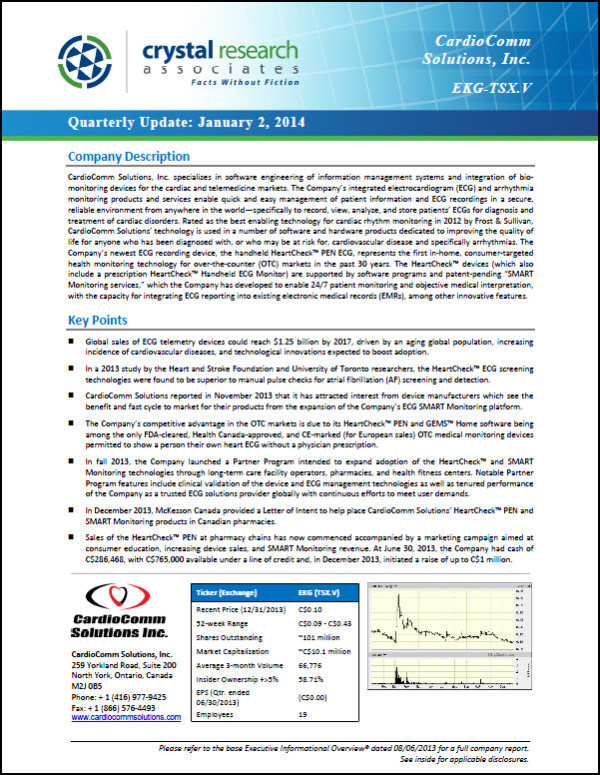 CardioComm Solutions, Inc. (EKG-TSX.V), a provider of innovative software solutions for information management systems in cardiovascular medicine and telemedicine, issued a letter to shareholders and friends yesterday detailing the company’s progress and goals to date. Earlier today, CardioComm Solutions, Inc. (EKG-TSX.V) announced that its partner, SunGard Availability Services (Canada) Ltd, is expected to promote a case study evaluating CardioComm’s use of SunGard’s cloud-based systems infrastructure as the platform for the Company's HeartCheck™ SMART Monitoring services. The case study serves as an external confirmation of CardioComm’s technical capabilities and is part of the Company’s efforts to secure independent validation of its HeartCheck™ SMART Monitoring solution. The companies signed a three-year partnership agreement in September 2012, which enabled CardioComm to use SunGard’s enterprise cloud services as the systems infrastructure to launch its HeartCheck™ SMART Monitoring services and the associated ECG Coordinating Centre (C4) in North America. CardioComm’s HeartCheck™ SMART Monitoring services are designed to support consumers who seek to prevent or manage cardiac disease by enabling these patients to track their ECGs anytime and anywhere in the world. The HeartCheck™ PEN (shown below) is currently being sold for $259 for the device. Each customer who purchases a HeartCheck™ PEN is also offered one complimentary ECG report provided by call center (C4) physicians, which encourages the patient to establish a relationship with a C4 physician and also serves as a baseline ECG reading for future reference. Subsequent ECG readings are charged on a per-use basis.